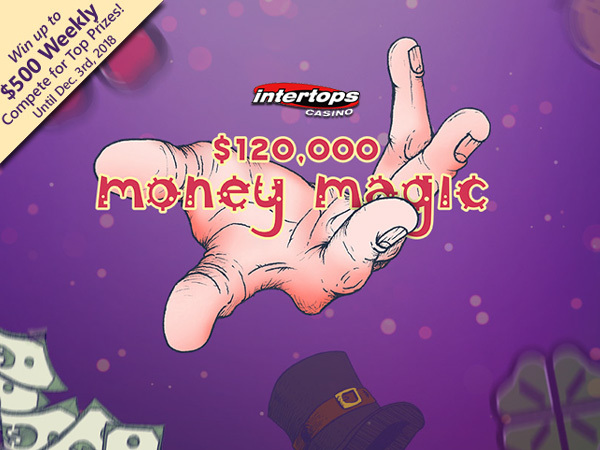 Players Compete with Each Other for Top Prizes in Intertops Casino’s Enchanting $120K ‘Money Magic’ Bonus Contest! competing with each other for a spellbinding $120,000 in prizes during the bewitching Money Magic bonus contest. $30,000 in Money Magic prizes will be awarded every week until December 3rd. Players at the top of the weekly contest leaderboard win top prizes – up to $500 each every week. The top 20 each week are also entered in a Final Draw for a $1000 cash prize with no wagering requirements. players but anyone, including occasional players, can win random draws held every Thursday. make for lots of prize-filled fun. Plentiful Treasure is an All Ways Pay game with 243 paylines. Scatters trigger the Gold Coin bonus feature where one of three jackpots can be won. Intertops Casino has been one of the most trusted online casinos in the world for more than twenty years. It offers a huge selection of slots and table games from Realtime Gaming.